My friend’s mother makes the most incredible, crisp, spicy, pickles I’ve ever tasted. She can pretty much make them in her sleep, as she has 40 years of experience, but even so, she has had her share of problems when pickling. One such issue has been hollow heart in cucumbers. Read on for cucumber hollow heart info. 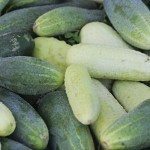 What Causes Hollow Heart in Cucumber Fruit? Hollow fruit, like a cucumber hollow in middle, is a common issue. While edible in theory, if cucumbers are hollow inside, they may be slightly bitter and certainly won’t win any blue ribbons. Hollow cucumbers, or any hollow fruit, result from a combination of lacking nutrient absorption or surplus, irregular watering and/or inadequate pollination. Environmental conditions are the most likely cause for a cucumber that is hollow inside. Cucumbers prefer consistently moist conditions in the garden for optimal growth. If you’re experiencing a period of drought or you just haven’t been keeping up on the watering, this could very well be the reason for a cucumber hollow in the middle. 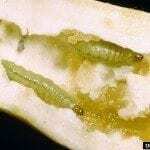 A surplus of nitrogen in the soil or low boron levels may result in hollow cucumbers. Too much nitrogen may make the fruit grow too rapidly, not allowing the interior of the cuke to keep up with the growth of the exterior. Reduce the amount of fertilizer being used to combat the issue of a cucumber with a hollow heart. Inadequate pollination can lead to a cucumber that is hollow in the middle. A hollow cucumber is a vacant seed cavity that is the result of a lack of seed formation traced back to inadequate pollination. This may be aggravated by rapid fluctuations in environmental conditions that affect fruit development, such as hot, dry weather, which may lead to irregular irrigation. Hot, dry weather reduces pollen viability and may scorch flower parts during pollination and is one of the factors, along with potential inadequate pollen transfer by pollinators and inadequate pollen sources, that can create hollow cucumbers. Genetics also plays a part in cucumbers that are hollow in the middle. There are some varieties that are less prone to this issue than others, so be sure to read the descriptions on seed packets or in seed catalogs. Then follow the directions regarding plant spacing and maintain an adequate irrigation schedule. 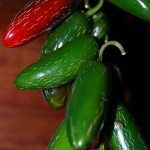 Lastly, if you are making pickles and you end up with hollow cucumbers, lingering between the picking of cukes and pickling them may be the cause. Use your cucumbers within 24 hours of picking, if possible, or refrigerate them until pickling time. To check for hollow cucumbers, look for those that float when washing.